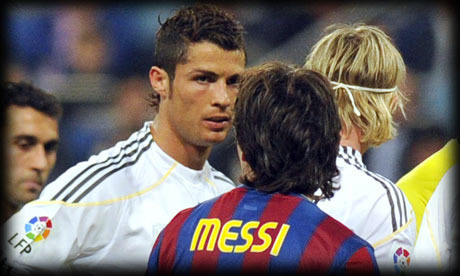 Messi: "I have a normal relationship with Cristiano Ronaldo"
19.03.2011 » Messi: "I have a normal relationship with Cristiano Ronaldo"
Speaking to Sky Sports, Lionel Messi confessed his eternal love to Barcelona and said that he has a very normal relationship with Cristiano Ronaldo, since they both respect each other. Lionel Messi granted an interview to Sky Sports, where he affirmed he has a normal relationship with Cristiano Ronaldo and that he would never play in Real Madrid because he wants to play in Barcelona until the end of his career. The Argentinian mega star also talked about how important Ronaldinho was in the beggining of his career, the alleged interest from Massimo Moratti (Internazionale President) on bring him to Inter, and answered a few questions regarding comparisons made with Diego Armando Maradona. Messi noted that he's aware the future of his own career doesn't only depend on him. However, "La Pulga" is sure of one thing: "I know we can never be sure of what's going to happen in football, but I would never go to Real Madrid. My intention is to play in Barcelona my whole career." Lionel Messi noted that Ronaldinho was one of his biggest influences when he started his path in Barcelona: "We had a truly great relationship, the same way I had with Deco, Sylvinho or Thiago Motta. They all helped me tremendously, but each one was special. They really made it very easy for me to feel welcomed in the locker room, which was something unique because of the ammount of stars Barcelona has. I can only thank them for being who I am today." Massimo Moratti, Inter Milan's owner and President, already confessed his admiration for both Cristiano Ronaldo and Lionel Messi in the past, but that doesn't seem enough to convince them to be willing to make a move to Internazionale. Messi: "I appreciate the kind words Moratti always has about me and all the praisings I receive from his side, specially since he's such a respected person in football. But like I said before, I don't want to leave Barcelona." The next question was about what kind of relationship Messi has with Cristiano Ronaldo, and the Argentinian said it wasn't particularly special, since it was just a normal professional colleague relationship. Messi: "I have a very normal relationship with Cristiano Ronaldo. We greet and salute each other when we meet and I respect Cristiano Ronaldo, just like Ronaldo respects me, but nothing more. We never had such a strong bond like I currently have with my Barcelona teammates, because we never had the chance to get to know better and deeper." You can watch Atletico Madrid vs Real Madrid livestreams today, here on ronaldo7.net. Cristiano Ronaldo will most certainly play and links will be updated around 30 or 60 minutes before the match starts.